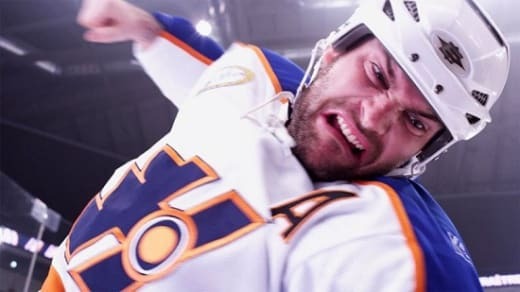 Goon is a triumph on a multitude of levels. The Jay Baruchel, co-writer and star, love letter to hockey’s enforcers is hilarious, heartfelt and shows why the game is so adored by so many millions. The film stars Seann William Scott (soon to be seen in April 6’s American Reunion) as a bar bouncer, whose family lets their disappointment with his professional prospects be known at every turn. Fate intervenes when, at a hockey game with his best pal (Baruchel), a player climbs into the stands to fight a patron. Scott’s Doug steps in and beats the player to a pulp. The local team’s coach sees something and gives the guy a chance to replicate what he did in the stands on the ice. The only problem: He's not such a great skater. Thus we have our first moments of hilarity! The film is based on the true story chronicled in the book Goon: The True Story of an Unlikely Journey into a Minor Hockey League. Doug Smith’s true story is slightly fictionalized in the movie, but its DNA is the same. Scott is a revelation and this is his film to shine. The actor shows depth of character that has never been so illustrated in his prior work. He is as tough as nails. Yet, he is the type of guy who rushes to help an elderly woman cross the street, hold open doors for women and treats each human being with pounds of respect. But on the ice, he is as brutal as they come. It is a career-making performance from an actor who was previously best known for being the source of laughs as Stifler in the American Pie movies. The story is set that he and the league’s best enforcer of all time, played with panache by Liev Schreiber, are on a collision course. Schreiber’s Ross Rhea is out serving a suspension for a brutal hit on a groomed-to-be NHL star learning the ropes in the minors. That hit did two things, sent Rhea out of the game for weeks in what is likely his final season -- and also made the hockey phenom he knocked out tentative where he used to be tenacious. While Rhea sits out, Doug’s star explodes. He is called “The Next Ross Rhea” and Schreiber’s character is none too happy, thus feeding the fire of their eventual passing-of-the-torch showdown. Further evidence of the softy-at-heart nature of Doug is shown in the budding romance with a hockey fan named Eva (Alison Pill). Their courtship feels like something out of a classic 1950s movie, rather than a film about one of hockey’s most brutal players. This is also where Scott’s star shines even brighter. You wonder how a woman could fall for such a, what seems on the surface, simpleton. Yet in the hands of Scott, not only is the romance believable, the audience is pulling for this couple to make it work. With Goon, Baruchel has penned the best all-out hockey movie since Slap Shot (What are the top 10 hockey movies?). It is as funny as that film that starred Paul Newman, but exceeds it in many ways with its effective use of sensitivity of the human spirit.